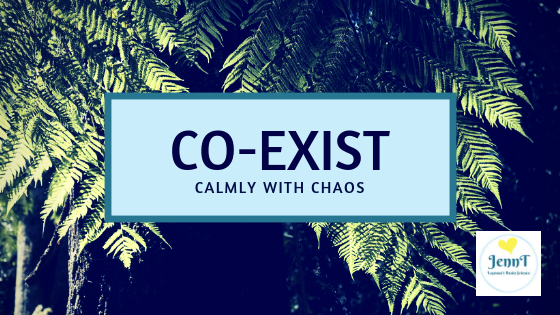 Jenn Turnham > Blog > Jenn Turnham's Words > Can you calmly co-exist with chaos? ….can you co-exist calmly with CHAOS….?? Learn this skill and you will cultivate poise, grace and equanimity……very helpful, given things are almost NEVER perfect in our crazy busy worlds…! Irritations and unresolved issues in life often go round and round in our heads keeping us awake at night, stressing us out during the day, as well as making it difficult to concentrate on tasks at hand. Have you ever had a disagreement or misunderstanding with a friend, colleague or family member and then can’t stop thinking about it until it gets resolved? The challenge with this is that it gets in the way of living LIFE. If we don’t learn to live with unresolved issues, we will never find peace because VERY RARELY are there times in life when things are PERFECT ie NO unresolved issues anywhere to be seen…. It also makes it MUCH harder to deal with REALLY serious unresolved problems when they inevitably arise.